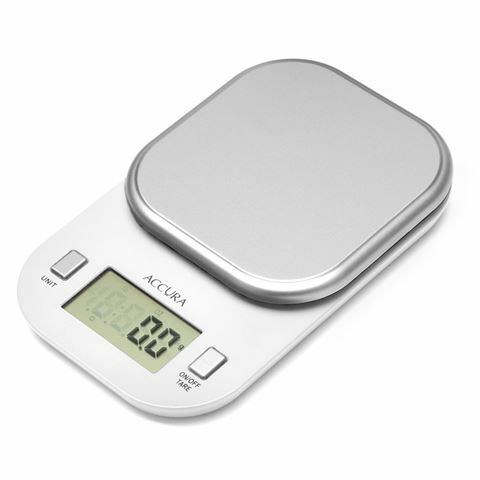 Accura Kitchen Scales aren’t just designed with scrupulous and precise chefs in mind – they’re also created for those who are health-conscious as well. The Pyxis Diet Scale is designed for those who are watching their portion sizes as a part of their diet regime, with a slim and compact design suitable for measuring small servings. Now you don’t have to use the palm of your hand to measure one serve of pasta, or a normal portion of chicken. The Pyxis Diet Scale is your little helper on the path to a healthier you. And it will also be of great use for small cooking tasks, or those days when you couldn’t be bothered to pull out the six-pound mechanical scales under the stairs. Plastic unit and measuring scale. Maximum capacity of 1kg or 1L. Compact design for small measuring tasks. Requires 1 x Lithium CR2032 battery (included). Dimensions: 10 x 15.5 x 3cm.